With our rich experience in the manufacturing industry, we are able to provide a wide assortment range of Rotary Airlock Valves allows you to choose the one as per your needs. Our primary aim is to satisfy our esteemed clients, thus we offer quality approve valves to all our clients. 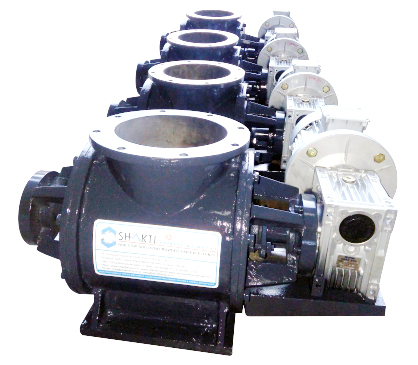 Rotary Airlock Valve is used to offer free flowing of dry powder and crystal or powder form of the various materials. Usually, rotary airlock valves are used in bulk handling systems to control the flow of powder form materials. It can seal and prevent the flow of the material by blocking the incoming material. You can select one rotary airlock valve as per your material density, the flow ability of the material, powdered or crystal form of material and the desired capacity. These are the factors which you should decide before making a purchase. Choose the one from wide assortment range which can complete the needs and requirements of your applications. This entry was posted in Material Handling Machinery and tagged Rotary Airlock Valves, Rotary Airlock Valves Ahmedabad, Rotary Airlock Valves India, Rotary Airlock Valves Manufacturer, Rotary Airlock Valves Supplier. Bookmark the permalink.